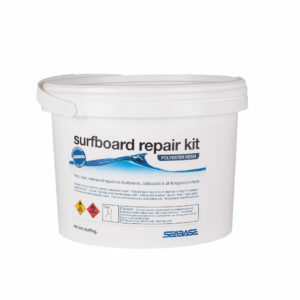 The Seabase Simple Resin Repair Kit for marine craft. We’ve never made enough of these simple Seabase Repair Kits – they sell out.Started in 1976 and relaunched this summer 2017, our comprehensive repair kit covers all the basic repair needs for both PU and Epoxy surfboards and marine craft. Complete with foam, fibreglass, resin, hardener, sandpaper, instructions – all you need to do your own repairs and save money. Useful for repairs to all marine craft or in any marine situation – boating, canoes, paddleboards, SUP’s, pools, ponds, roof leaks – anywhere where a permanent clear, waterproof is needed. One size kit containing 125 ml of polyester repair resin (150 ml in Epoxy Resin) plus all else you need. Also available soon in a solar curing resin. Order the special order large repair kit for bigger jobs.